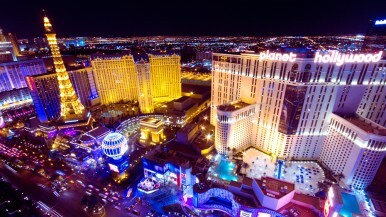 Las Vegas/Berlin. Innovative living comfort: as a mobile well-being sensor, the Bosch Smart Home AIR supports to ensure a healthy indoor climate and optimal air throughout the entire house. On average, we breathe in and out approx. 11,000 litres of air daily – based on volume, that is far more than we eat or drink. 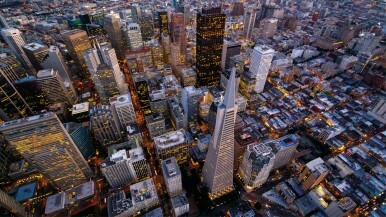 We spend 90% of our lives inside buildings. This makes it all the more important that the room air quality is good. Unfortunately, that is often not the reality: indoors, air pollution can be up to five times higher than it is outdoors. Mostly, volatile organic compounds (VOCs) are to blame – for example, evaporated cleaning agents or vapours from furniture that influence our health. Additional factors are insufficient lighting and high noise levels that can cause stress. This may result in stress-related risks like insomnia, concentration difficulties or headaches – typical "sick building problems". The mobile well-being sensor AIR, from Bosch Smart Home, ensures better living and quality of life. Every five minutes, it regularly measures the most important factors for a healthy indoor climate – air quality, temperature and humidity, as well as brightness and noise level – and displays these directly on the device and in the Bosch AIR app (available for iOS and Android). Thus, users constantly have the indoor climate status in sight and additionally receive valuable tips on ventilation practices. For comprehensive well-being, the AIR also measures indoor brightness and noise levels, which are displayed in the app. Lighting conditions influence productivity and mood, while noise can affect quality of sleep. Parents in particular can provide optimal conditions for themselves and for their children – for healthier sleep, better concentration and improved well-being. Small, light, battery-operated and therefore flexible for usage throughout the entire house or even on the go. Thanks to self-explanatory icons and an LED light ring on the device, the mobile well-being sensor also functions entirely independently, without the app. The detected data for humidity, air quality and temperature are displayed by icons in traffic light colours. For example, the current humidity is depicted using "water drop symbols" (one small drop = too dry, two larger drops = too humid). The LED light ring combines these data into one value, and accordingly lights up red, yellow or green. An intuitive double-tap on the top of the AIR starts an additional measurement. The sleep mode is activated just as easily: simply turn the AIR over – and just like that, Bluetooth and visualisation are deactivated. Measurements are continuously carried out and saved on the device for up to four weeks. Via Bluetooth, the mobile well-being sensor can be linked with the Bosch AIR app. There, users will find detailed results for the measured ambient values, even over time. Furthermore, the app allows individual settings to be made, such as the defining limit values for each measurement, or how often measurements should be shown by the device lighting up. In the app, up to three AIR devices can be integrated, in order to keep an eye on every room. 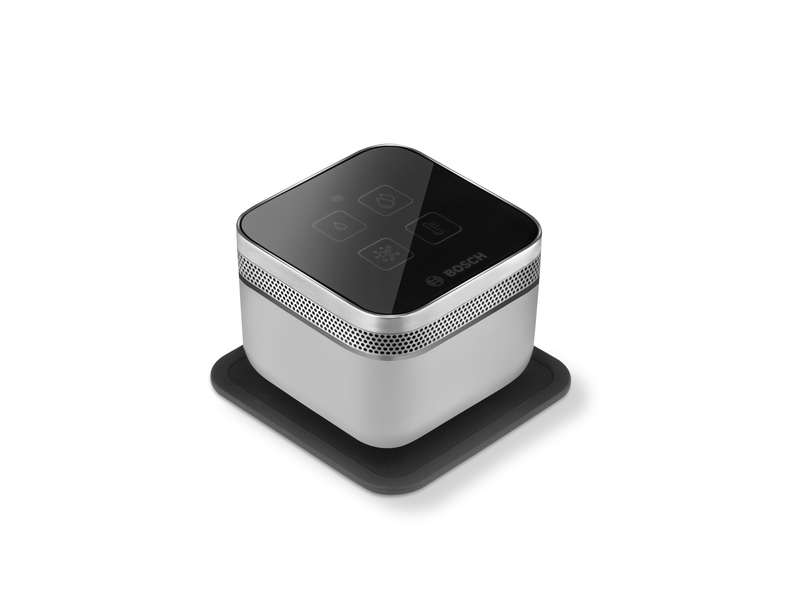 Additionally, up to three smartphones can access one AIR. Thus, the entire family can easily check the indoor climate, brightness and noise levels in the entire house. According to Bosch's estimates, around 20% of all buildings in Europe have mould issues, which are mainly caused by high humidity. The AIR regularly measures humidity, just as other indoor climate factors, and saves them for eight weeks in the Bosch AIR app. 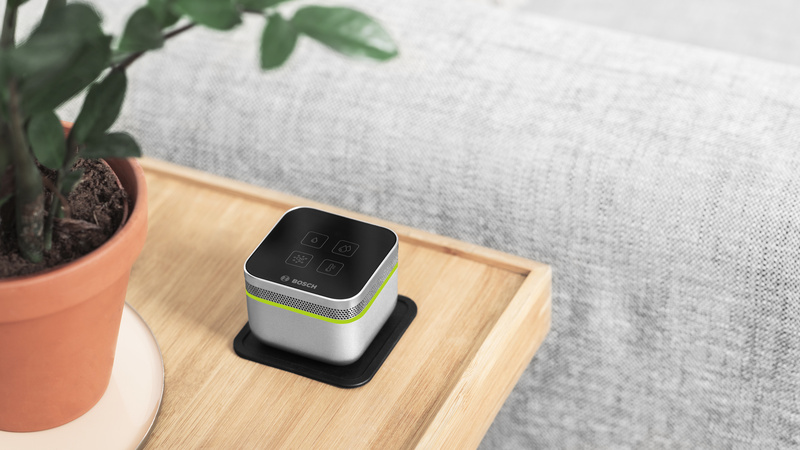 With this monitoring, the "vital signs" of living space are always in view, like they are on a fitness tracker. Residents can therefore recognise negative tendencies in indoor climate early on – and can actively prevent expensive renovation costs. 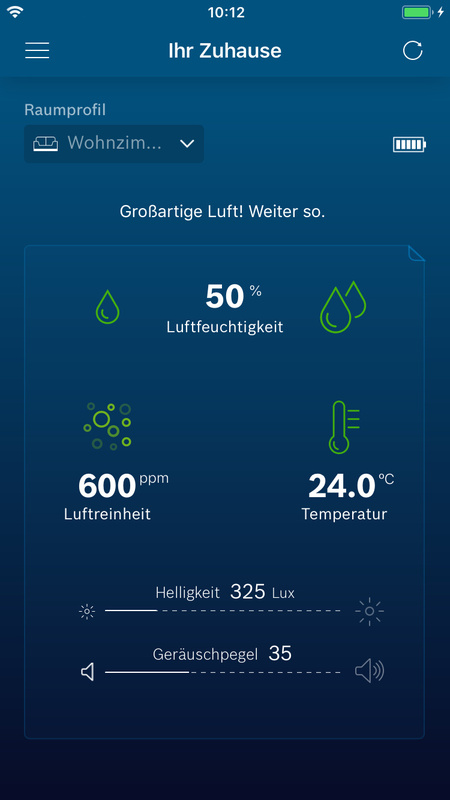 The Bosch AIR app provides optimal levels for each type of living space, which users can take as a basis. 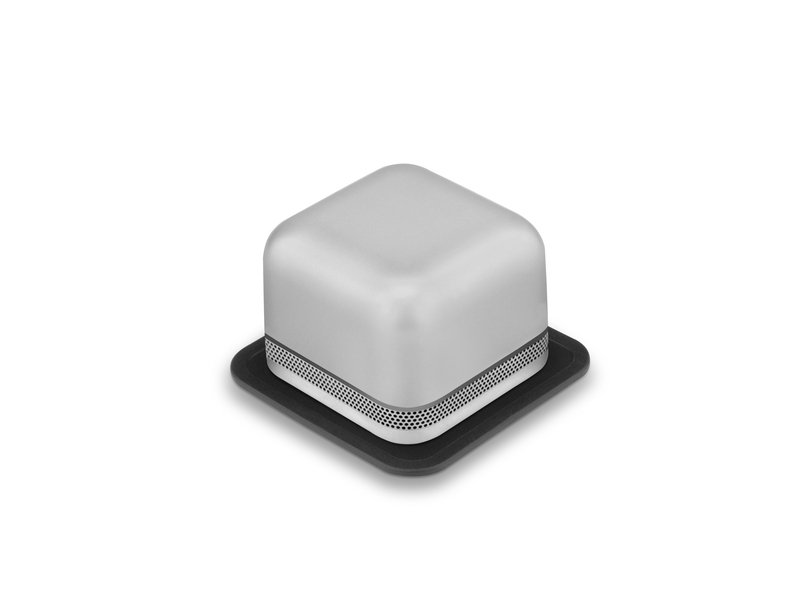 Of course, the well-being sensor can also be set based on individual and personal preferences. All measured data are analysed with Bosch Sensor know-how and specially-developed algorithms. Valuable ventilation recommendations and useful information for a healthy home are obtained on this basis. Incidentally, the well-being sensor supports the reduction of energy consumption with tips for optimised and need-oriented ventilation. This pays off, particularly in the winter: up to half of heating energy is lost due to incorrect ventilation practices. Therefore, the AIR not only preserves health, but also the environment and your wallet. 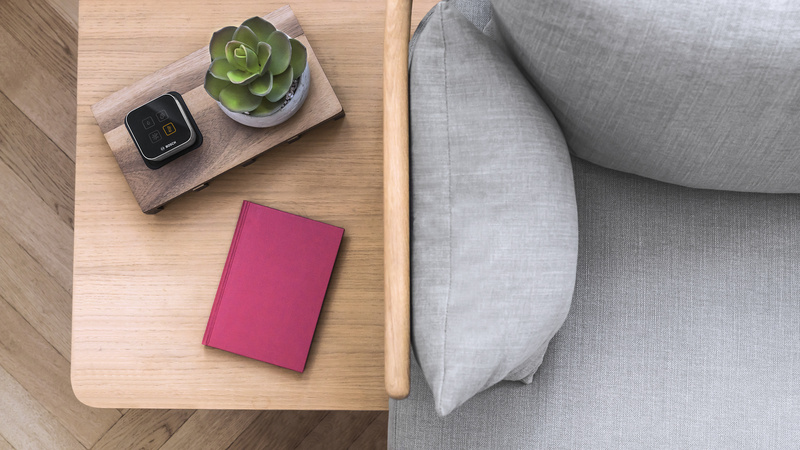 A real looker: with the compact and mobile AIR, users can very easily take the control of their home environment into their own hands. 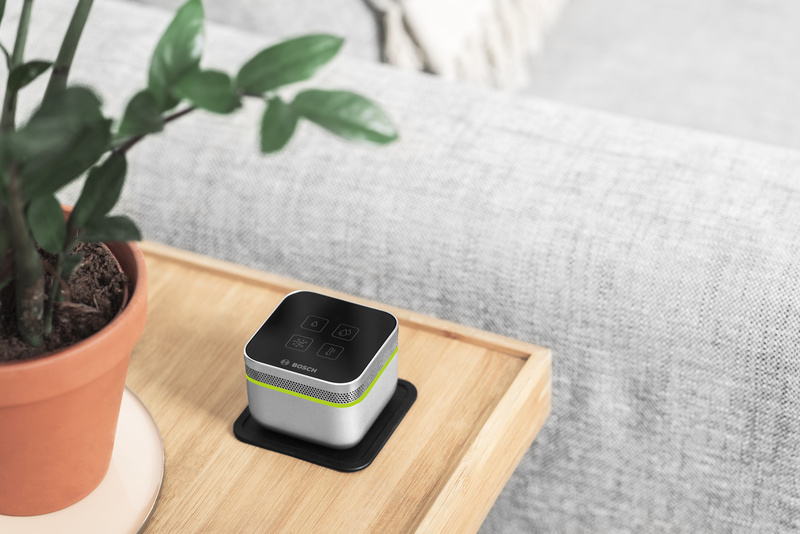 The relevant indoor climate data are visualised by the high-value sensor cube directly on the device, with icons and an LED light ring in traffic light colours. Aesthetic and intuitively understandable. Such elegance and functionality is also convincing expert juries: its outstanding design earned the Bosch Smart Home AIR the IF Design Award and the Red Dot Design Award. With the attractive, mobile well-being sensor in your house, things are looking good for your wellness. Cleverly thought through: a pad for protecting the device is also included in the box contents. With this, the AIR is always kept safe, even in turbulent everyday life. Incidentally, the pad provides handling information and icon meanings on its reverse side. 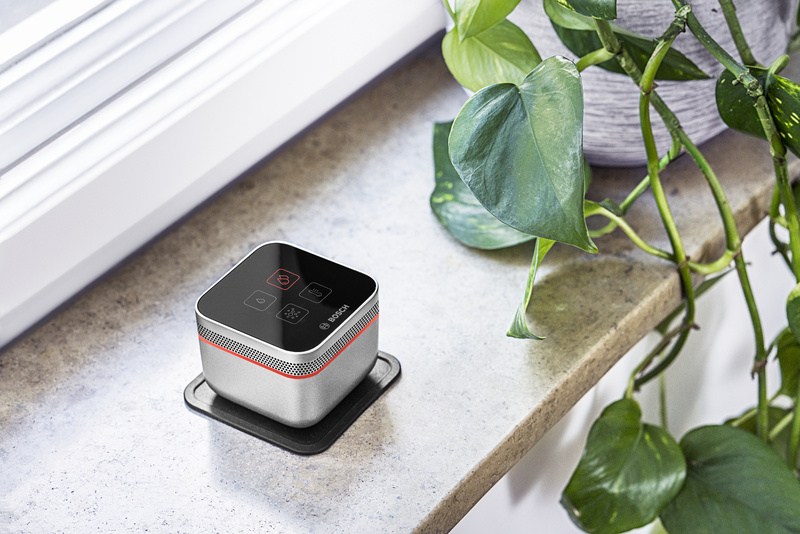 The mobile well-being sensor AIR can not only be used as a single solution with a Bluetooth connection and its own app, but also integrated into the Bosch Smart Home System. In the system, the sensor opens up even more possibilities: with a connection to the Bosch Smart Home Controller, all measured values can be viewed even on the go. 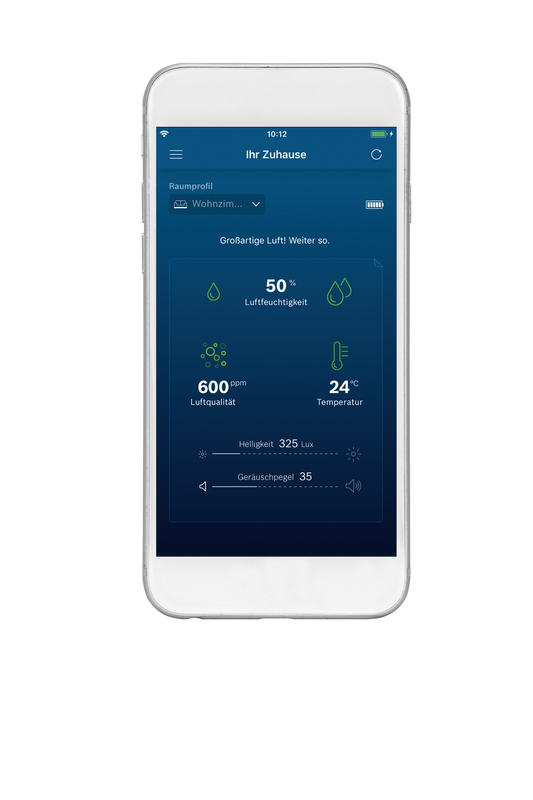 The Scenario Manager offers additional advantages for a variety of new application options: when the humidity level exceeds or fails to meet the defined target value, for example, a humidifier or dehumidifier with a Bosch Smart Home Plug can then go about its work automatically. For even more possibilities within the system. 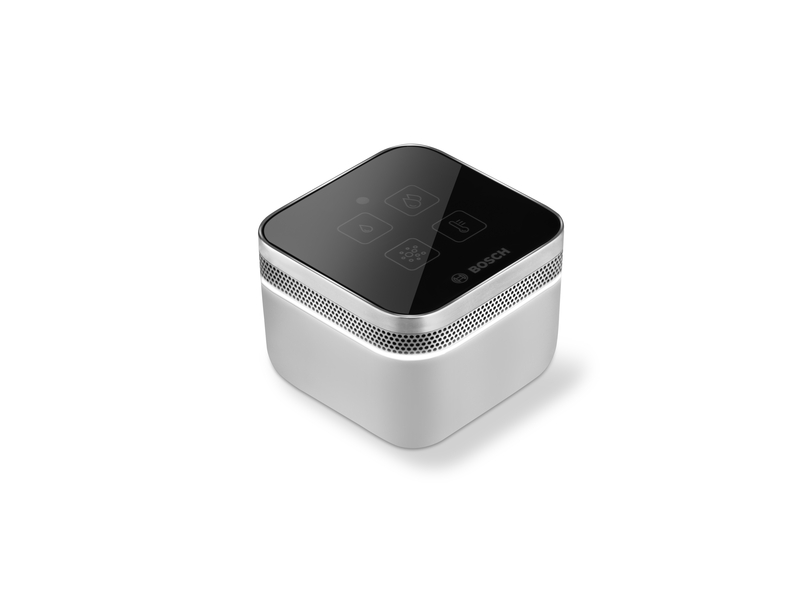 In short: the Bosch Smart Home AIR is the small, clever helper for a greater sense of well-being at home. 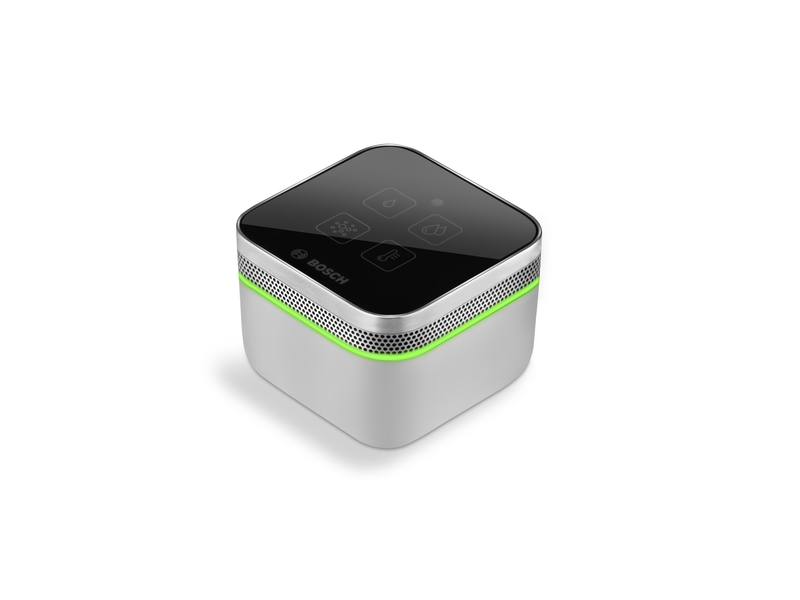 This device allows its users to breathe easier, and increases health and well-being with an improved indoor climate and better air quality. Robert Bosch Smart Home GmbH was incorporated as a fully owned subsidiary of Robert Bosch GmbH. Headquartered in Stuttgart-Vaihingen, the company offers complete, intelligent consumer solutions for networked homes. Bosch Smart Home simplifies home life by controlling routine tasks in the background. It offers greater comfort, security and energy efficiency. Find out more at www.bosch-smarthome.com. The Bosch Group is a leading global supplier of technology and services. It employs roughly 402,000 associates worldwide (as of December 31, 2017). The company generated sales of 78.1 billion euros in 2017. Its operations are divided into four business sectors: Mobility Solutions, Industrial Technology, Consumer Goods, and Energy and Building Technology. As a leading IoT company, Bosch offers innovative solutions for smart homes, smart cities, connected mobility, and connected manufacturing. 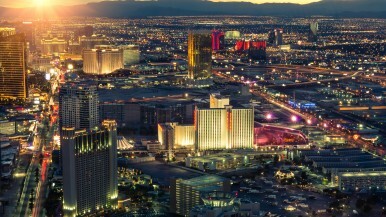 It uses its expertise in sensor technology, software, and services, as well as its own IoT cloud, to offer its customers connected, cross-domain solutions from a single source. The Bosch Group’s strategic objective is to deliver innovations for a connected life. Bosch improves quality of life worldwide with products and services that are innovative and spark enthusiasm. In short, Bosch creates technology that is “Invented for life.” The Bosch Group comprises Robert Bosch GmbH and its roughly 440 subsidiary and regional companies in 60 countries. Including sales and service partners, Bosch’s global manufacturing, engineering, and sales network covers nearly every country in the world. The basis for the company’s future growth is its innovative strength. At 125 locations across the globe, Bosch employs some 64,500 associates in research and development.To learn more, please visit www.bosch.com, iot.bosch.com, www.bosch-presse.de, twitter.com/BoschPresse.